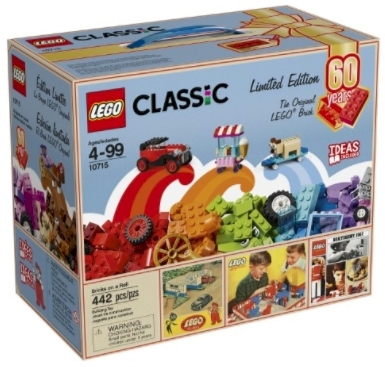 This LEGO Classic Bricks on a Roll 60th Anniversary Limited Edition Set (#10715; 442 pieces) is just $25.00 with free in-store pickup at Walmart (or it ships for free with a $35 minimum order). After you purchase the set at either Walmart or Jet, make sure you snap a photo of your receipt and upload it here and you will get a free limited edition LEGO collectible booklet as well. Description: Put your LEGO creations on wheels with this exciting LEGO Classic toy, featuring a wide selection of wheels and tires in a variety of colors and sizes, plus a colorful selection of LEGO pieces, including bricks, shapes and eyes. This set makes a great addition to existing LEGO sets and includes age-appropriate building instructions that will help your child discover their creative building skills. Makes a GREAT Afikoman gift!